I created this felt owl mask pattern originally to appear on the Sew Mama Sew blog where I contribute free sewing patterns every now and then. Be sure and pop on over there for so much sewing goodness and tutorials! This Owl mask is big on style and detail but actually pretty simple to make. You could even get away with hot glue gunning the whole thing, without a lick of stitches involved! I think this mask is perfect for a unique woodland style Halloween costume. But these can be kept year round as fun dress-up play items. Begin by cutting all of the felt pieces out as per the printable sewing pattern. Do this by choosing to either trace each piece onto your chosen felt colors, or simply tape the pieces down to the felt with wide tape and simply cut on the lines. This method works especially well for cutting out very small pieces. To add detail to the mask, begin by stitching contrasting lines with colored embroidery thread along the ear tufts and bottom fringe of the mask. 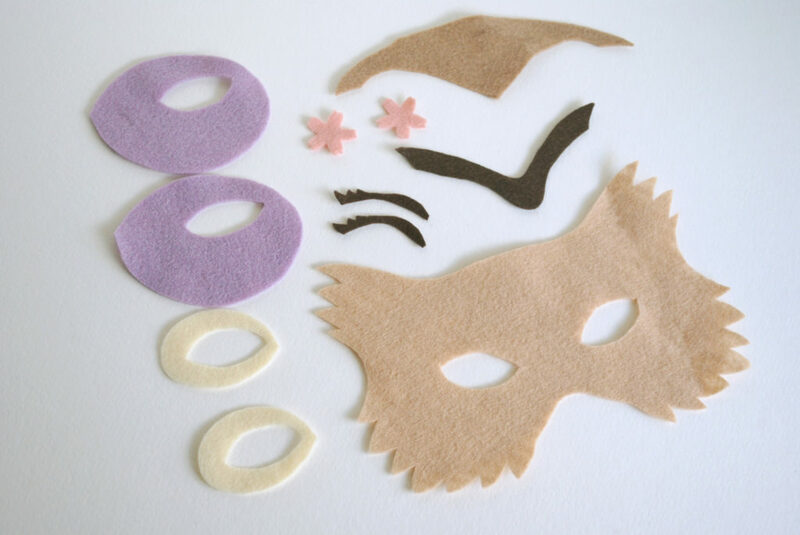 You can also substitute fabric paint for embroidery thread for a quick and easy mask. Next match the “hood” piece to the top of the mask and sew in place. Add the “Brow” piece and stitch in place much the same as above. Sew the “Inner Eye Detail” to the “Outer Eye Detail”, and add decorative detail stitches. Sew the “Eyelash” pieces on top. To add more detail to the mask you can choose to add little rosettes and leaves to the eye section, using french knots and lazy daisy stitches. I’ve made a quick youtube primer on how to create these cute rosettes. Match the Outer eye pieces to the top base of the mask and sew in place. Next add a flower to the top middle of the mask, stitching in place with a single stitch in the middle of the flower, leaving the edges free. Stitch another flower piece on top in the same manner, but slightly skewed so the petals from the flower beneath show. Add a small decorative button or bead to the middle of the flower. Next stitch some small leaves in place outlining the flower detail. Stitch together the beak along the upper edge. Pin it in place and attach to the front of the mask. Attach a long ribbon across the inside/back of the mask, either stitching in place or hold in place with a hot glue gun. Sandwich the ribbon between the top base of the bask and the back base. Stitch the two layers together at the outer edges. My printable felt owl mask pattern includes pieces to make this mask, and the moon and stars mask! But you can easily mix and match with different colors and your own imaginative ideas for decorative Halloween owl masks! Dont miss out! If you’re not into sewing or making your own felt owl masks the pattern also includes printable owl masks that you can color in yourself!